The process of desalinating sea water to make it drinkable has a long and rich history. Some of the earliest appearances of desalination in history date back to experiments by Aristotle. Desalination is a technology with a long history. Man has always looked to the sea, dreaming of the benefits of obtaining drinking water from the oceans and even the Bible mentions a miraculous desalination. Some of the earliest appearances of desalination in history date back to experiments by Aristotle and other intellectuals in ancient Greece. The brilliant minds of that era came up with distillation and filtration using soil deposits to try and obtain drinking water from the sea. ” Prior to the Second World War, desalination systems based on evaporation were commonly employed in boats. Desalination contraptions based on evaporation were proposed centuries ago but were not incorporated into boats until the 16th century, allowing them to be self-sufficient in the event of an emergency. Prior to the Second World War, desalination systems based on evaporation were commonly employed in boats that crisscrossed the oceans on long trans-Atlantic voyages. However, the first large-scale modern desalination process to appear was multi-stage flash distillation (MSF) during the mid-20th century in the USA (1955). Furthermore, although multi-effect distillation (MED) had been discovered and had the potential to be more efficient than MSF, it took a while longer to make the MED process efficient on an industrial scale and this did not occur until 1959 when the first MED plant was constructed in Aruba. The following year, the first synthetic and functional reverse osmosis membrane was produced at the University of California, made from cellulose acetate. This membrane was capable of blocking the salts while allowing water to pass through it at a reasonable rate of flow under high pressure. In reverse osmosis, pressure is the driving force in the separation process and the hydraulic pressure must exceed the osmotic pressure of the water to be desalinated. ” In Spain, the first desalination plant was constructed in Lanzarote in 1964. This invention marked the start of a race in membrane desalination technologies and the first commercial desalination plant using reverse osmosis was inaugurated in California in 1965 at the Coalinga desalination plant, used for brackish water. It took a further nine years for the first sea water reverse osmosis desalination plant to come into operation, in 1974 in Bermuda. 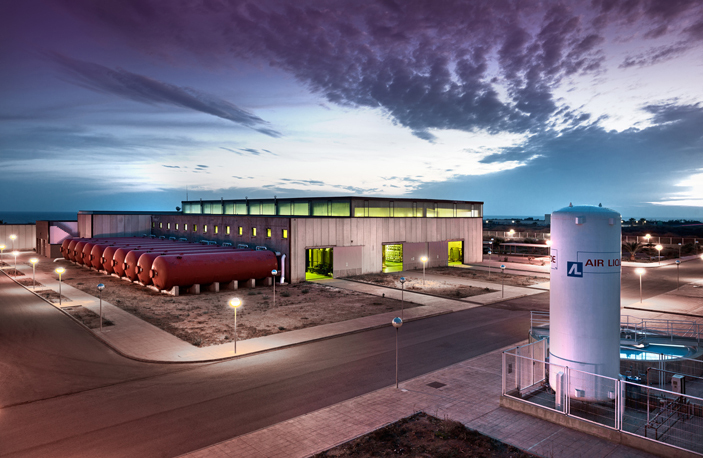 In Spain, the first desalination plant was constructed in Lanzarote in 1964. Thermal desalination and membrane desalination have evolved side-by-side from these early advances in search of greater energy efficiency and lower costs based on technological advances, economies of scale and optimization of the different desalination processes used. The key to energy efficiency in desalination is the estimated thermodynamic limit for desalinating water. This depends on the physio-chemical characteristics of the water being treated, the recovery percentage of the process and the salinity of the water. For example, the minimum theoretical energy required to desalinate sea water with a salinity of 35 g/L, for a standard recovery of 50%, is 1.06 kWh/m3. It is estimated that, at present, more than 60% of all installed capacity uses reverse osmosis technology and this ratio is expected to continue rising in the coming years since reverse osmosis has proved to be a reliable and more energy efficient technique than thermal desalination processes. Strategy and Corporate Development Manager, Abengoa Water. Kollsman is grandfather to human dialysis methods 1950's waste treatment and, by the end of the 1960's, at least 20 Kollsman patents in regenerative ion exchangers and reverse osmosis desalinization (salt water to drinking water) fundamental groundbreaking methods. US2799644 Saline-saltwater to fresh water conversion Nov 18, 1955. US8658043 Siemens Water saline treatment system patent refers first to 5 essential-fundamental Paul Kollsman patents on the high pressure Reverse Osmosis (RO) filtering at the microns molecule levels. Did his fist full of patents spark the spur to today's 13,000 world wide desalination plants? Paul Kollsman had some 19 different patents on the electrolysis fractionation of ionic liquids deionized/anti polarization ion exchange at high temperature various processes. First and fundamental was Kollsman's US2689826 electro-dialysis filed on Jul 21, 1950, US3099615 Electrodialysis involving periodic reversal on Feb 13, 1961, US2815320 Treating IONIC FLUIDS dialysis method Oct 23, 1953, US2854393 Fractionation Jul 23, 1954, US2854394 Fractionation by electrodialysis Nov 1, 1954, US2891900 Deionized by Electrodialysis conversion, and his US2891900 Tortuous path prevention of popularization in Electrodialysis filed on Oct. 22, 1957. Until the following 4-issues are resolved, desalination will never be selected as the solution to the growing global water crises. 1. Environmental impact 2. Health issues with Long term consumption of desalinated water 3. Unacceptable high production energy consumption. 4. Monetary cost beyond the reach of those who need it most. All of these issues can be resolved by abandoning the destructive and discredited open-intakes in favour new seawater abstraction methods. I am really grateful to the owner of this website who has shared this enormous paragraph at here.